Prison is the last map in Slenderman's shadow game series. It takes place in an abandoned prison. 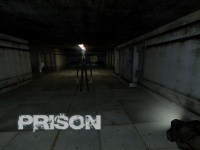 The main mission is to collect 8 photos spread in any room or corridor in the prison without being caught by Slender. Large prison will be another challenge to examine every room and path which are similar one another. All rooms are limited with iron trellis. The paths to go through are similar with others, leading to confusing and defenseless feeling. But Slender never stop to haunt you. Suddenly he would be near your side or behind you when you look back. Just run faster to the opposed direction to prevent being caught while continue finding the remaining photos. Spooky backsound increases the horror atmosphere. At the beginning, the situation is a little bit more silent. Only sound of heartbeat comes occasionally. But as you walk through every dark rooms and corridors, the tension is increasing. Not because Slenderman has shown up hisself, but the background sound makes it feels more frightening. The heartbeat sound is becoming louder and faster. An indication that Slender is not too far from your position. Control keys with ease. The only thing you do in this game relating to keyboard button is simply move and click. Use W,A,S,D keys or arrow keys to move and mouse click to grab the photos. To perform a sprint, press SHIFT while moving. In case of sprinting too long will grab slenderman attention, so don't do sprint too much. Finally, slenderman's Shadow - Prison as the last series provides higher difficulty levels for the player to finish all mission while keeping the horror aspect on top. Help Gregory to solve all weird things he experienced in his house. Collect all 8 pages and avoid the Slender in spooky sanatorium environment.